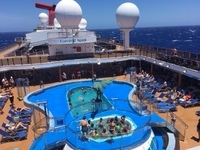 I chose the 3 night four day Carnival Cruise out of Sydney because it was my first cruise and I wasn&apos;t convinced I was a &apos;cruising&apos; kind of person. I was right. I&apos;m not. At least I&apos;m not a Carnival Cruise kind of person. The embarkation was horrific. Loaded like cattle, they crammed us all into the buffet area because their determination to get in and get out as fast as possible means they get you on board before your rooms are ready. EVERYONE - and I mean every 2,124 passengers - are crammed into the buffet area waiting for their rooms to become available. There&apos;s not enough seats and tables. People are pushing and shoving. It was horrendous. That was bad enough but then we had to do the muster. Unlike other cruise lines that &apos;muster&apos; in lounges in a calm and serene fashion, Carnival herded us onto decks. They forced us to stand in 34 degree heat, shoulder to shoulder FOR AGES until blasting a horn and letting us free. More shuffling in long queues as again we depart our muster locations like herded cattle. Still the rooms aren&apos;t available. The lifts aren&apos;t available either because of the baggage being brought on board so it&apos;s all stairs (with a torn meniscus so that just added salt to the wound). I&apos;ll summarise the rest because the first day was by far the worst but not the only disappointment. The spa massage was a constant up-sell. Even mid-massage so not exactly relaxing. The chat app (which isn&apos;t free) wouldn&apos;t work properly and we had to queue (again) to get help from guest services. I say help but "it&apos;s probably just your phone" wasn&apos;t that helpful. The son never managed to get his phone connected but I still paid the $9 - YES NINE - to NOT be able to chat with him while on board. Unless you&apos;re a kid or an adult with no personal space requirement DO NOT EXPECT A SWIM! There aren&apos;t pools on the boat. There are oversized spas masquerading as pools. Look closely. The promise is luxurious. The reality is the pools are TINY. They make them LOOK big buy surrounding them with overflow areas twice the size of the pool. Day two they closed one of them so that left us with 2,000 people and one 18+ pool and one family pool. Do the math! Disembarkation is the reverse order of the unpleasantness getting on. We had to rush breakfast, rush packing and rush to get off the boat by 8am. Why? Because they&apos;re ready to cram on the next load of victims of course. We left a phone in the room in our rush to get out on time. How we lost something in a room that was 2m x 1m I&apos;ll never know. The highlight was the dining room. The food was first class. Really amazing. There was a little wobble on the last night with a couple of dishes that were below their unusually high standard. If it wasn&apos;t for the food, I&apos;d be demanding my money back. The staff are 97% wonderful. A couple of individuals who probably shouldn&apos;t be cruising but the vast majority are friendly, professional, helpful and the saving grace of Carnival Cruises. Clearly some people have no problem being crushed, and queued and rushed. I don&apos;t. I like space. I like peace and quiet and I expect a pool bigger than a spa bath.The images on their website are mis-leading. I&apos;ll post pictures of the pools. Judge for yourself. It was extremely hard to find anywhere with a calm, relaxing environment. The Sun Lounge area was my version of hell on earth. Loud DJ music, people and kids running around everywhere and everyone jammed into close quarters. Don&apos;t go expecting to have a comfy sun lounge in a quiet corner of the boat somewhere. The rear of the boat was largely devoid of crowds but there was nowhere to sit and relax so that was yet another disappointment. There simply isn&apos;t enough boat and there&apos;s too many people. One of the pools closed on the second day. Look closely. The dark blue area is NOT pool! 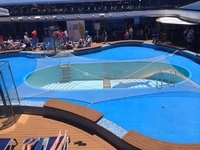 I chose the 3 night four day Carnival Cruise out of Sydney because it was my first cruise and I wasn&apos;t convinced I was a &apos;cruising&apos; kind of person. I was right. I&apos;m not. At least I&apos;m not a Carnival Cruise kind of person. The embarkation was horrific. Loaded like cattle, they crammed us all into the buffet area because their determination to get in and get out as fast as possible means they get you on board before your rooms are ready. EVERYONE - and I mean every 2,124 passengers - are crammed into the buffet area waiting for their rooms to become available. There&apos;s not enough seats and tables. People are pushing and shoving. It was horrendous. That was bad enough but then we had to do the muster. Unlike other cruise lines that &apos;muster&apos; in lounges in a calm and serene fashion, Carnival herded us onto decks. They forced us to stand in 34 degree heat, shoulder to shoulder FOR AGES until blasting a horn and letting us free. More shuffling in long queues as again we depart our muster locations like herded cattle. Still the rooms aren&apos;t available. The lifts aren&apos;t available either because of the baggage being brought on board so it&apos;s all stairs (with a torn meniscus so that just added salt to the wound). I&apos;ll summarise the rest because the first day was by far the worst but not the only disappointment. The spa massage was a constant up-sell. Even mid-massage so not exactly relaxing. The chat app (which isn&apos;t free) wouldn&apos;t work properly and we had to queue (again) to get help from guest services. I say help but "it&apos;s probably just your phone" wasn&apos;t that helpful. The son never managed to get his phone connected but I still paid the $9 - YES NINE - to NOT be able to chat with him while on board. Unless you&apos;re a kid or an adult with no personal space requirement DO NOT EXPECT A SWIM! There aren&apos;t pools on the boat. There are oversized spas masquerading as pools. Look closely. The promise is luxurious. The reality is the pools are TINY. They make them LOOK big buy surrounding them with overflow areas twice the size of the pool. Day two they closed one of them so that left us with 2,000 people and one 18+ pool and one family pool. Do the math! Disembarkation is the reverse order of the unpleasantness getting on. We had to rush breakfast, rush packing and rush to get off the boat by 8am. Why? Because they&apos;re ready to cram on the next load of victims of course. We left a phone in the room in our rush to get out on time. How we lost something in a room that was 2m x 1m I&apos;ll never know. The highlight was the dining room. The food was first class. Really amazing. There was a little wobble on the last night with a couple of dishes that were below their unusually high standard. If it wasn&apos;t for the food, I&apos;d be demanding my money back. The staff are 97% wonderful. A couple of individuals who probably shouldn&apos;t be cruising but the vast majority are friendly, professional, helpful and the saving grace of Carnival Cruises. Clearly some people have no problem being crushed, and queued and rushed. I don&apos;t. I like space. I like peace and quiet and I expect a pool bigger than a spa bath.The images on their website are mis-leading. I&apos;ll post pictures of the pools. Judge for yourself. It was extremely hard to find anywhere with a calm, relaxing environment. The Sun Lounge area was my version of hell on earth. Loud DJ music, people and kids running around everywhere and everyone jammed into close quarters. Don&apos;t go expecting to have a comfy sun lounge in a quiet corner of the boat somewhere. The rear of the boat was largely devoid of crowds but there was nowhere to sit and relax so that was yet another disappointment. There simply isn&apos;t enough boat and there&apos;s too many people. The cabin is tiny but I expected that. The bathroom was efficient and (mercifully) the shower functioned well.